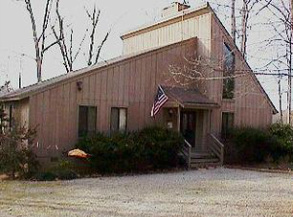 We have over a dozen Lake Gaston vacation rental homes available for weekly rent. The homes rent Saturday to Saturday and require a $200 deposit to reserve, which is refundable after you check-out. 1 king bed, 1 queen, 1 double sleeper sofa, 2 single beds, 2 full baths, central air conditioning, no dishwasher, microwave, washer & dryer, telephone, cable television, DVD player, high speed wireless internet, large lakefront deck, gas grill, and a dock. 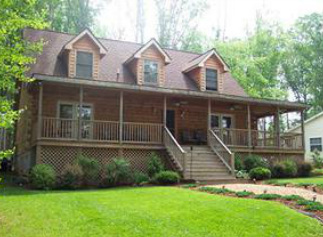 This beautiful two story log cabin is on three flat, heavily wooded, waterfront lots with great privacy. It's on a small cove in Pea Hill Creek in the northeast quad. Ideal for skiing and fishing. Good shallow wading area, with a sandy bottom, for children in front of the bulkheading. A non-smoking home. The new owners are still furnishing their house and will have updated pictures shortly! 2 queen beds, 2 single beds, 4 sets of bunk beds, 3 full baths, central air conditioning, dishwasher, microwave, washer & dryer, telephone, cable television, DVD player, wireless internet, large lakefront deck, gas grill, a dock with 8' of water, a sundeck on top of the boathouse, and a small sandy beach. This ranch home with a full finished walk out basement is on a small cove directly off the main Lake in the southeast quad in a very nice neighborhood. Ideal for water sports and fishing. A non-smoking home. 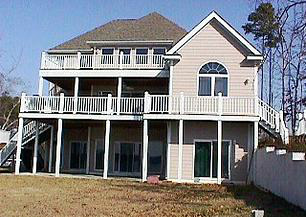 Call 252-586-5542 or email info@lcrlakegaston.com for Lake Gaston rentals & reservations. 1 king bed, 1 queen, 3 doubles, 2 singles, 2 sets of bunk beds, 2 full baths, central air conditioning, dishwasher, microwave, washer & dryer, telephone, cable television, DVD, pool table, ping-pong table, 2 lakefront porches, gas grill, and a dock with a sundeck on top of boathouse. This 3 level home has a walkout finished basement. On a gently sloping lot with an excellent view of Pea Hill Creek in the northeast quad. Ideal for skiing and fishing. Good shallow wading area in front of the rip-rap. A non-smoking home. 1 queen bed, 1 queen sleeper sofa, 4 sets of triple bunk beds, 1 crib, 2.5 baths, central air conditioning, ceiling fans, dishwasher, microwave, washer & dryer, telephone, satellite television, DVD player, wireless internet, a big lakefront porch, gas grill, dock, and a sandy wading beach for small children. 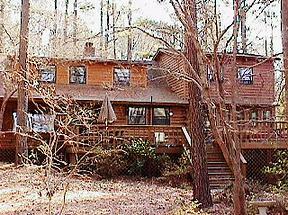 This two story like new Lake Gaston log home is on a gently sloping lot on a large cove in Pea Hill Creek in the northeast quad. Excellent view. Ideal for skiing and fishing. A non -smoking home. 1 king bed, 1 queen sleeper sofa, 1 double sleeper sofa, 2 sets of bunk beds, 2 full baths, central air conditioning, dishwasher, microwave, washer & dryer, telephone, satellite television, DVD player, lakefront porch, gas grill, a sundeck on top of the boathouse, and a dock with 5' of water off the end. 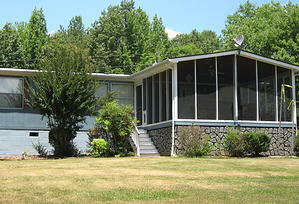 This one story home is on a large cove in the southwest quad on Hubquarter Creek. It has a small sandy wading beach for children and a paddle boat for guest use. A non-smoking home. 1 king bed, 3 queens, and 4 single beds), 4 ½ baths (one with a garden tub), central air conditioning, dishwasher, microwave, washer & dryer, telephone, cable television, DVD player, high speed wireless internet, wet bar, gas grill, upper and lower lakefront decks, and a dock with a sundeck on top of the boathouse. 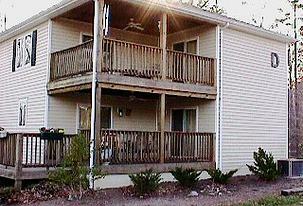 This is a very upscale, large, almost new Lake Gaston rental with three finished levels. It's on a gently sloping lot on a large cove, in the northeast quad, with a view of the main Lake. A non-smoking home. 2 queen beds, 2 singles, 2 sets of triple bunk beds, 2.5 baths, central air conditioning, dishwasher, microwave, washer & dryer, telephone, cable television, DVD player, ping-pong table, a lakefront porch, patio, gas grill, and a dock. In an excellent neighborhood. On a gently sloping lot on a large cove in Big Stonehouse Creek in the southeast quad with a good shallow wading area for small children in front of the bulkheading. A non-smoking home. 1 king bed, 1 queen, 1 double, 1 double sleeper sofa, 2.5 baths, central air conditioning, dishwasher, microwave, washer & dryer, telephone, cable television, DVD player, 2 lakeside porches, and a gas grill. 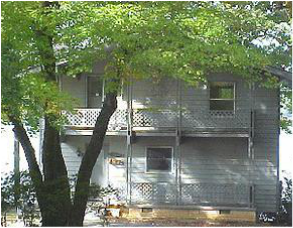 This almost new two story townhouse is in the second row from the Lake, in the southeast quad, on Big Stonehouse Creek. It's approximately a 275 foot walk to the water. You have a boatslip, a common dock to swim and fish from, and a community swimming pool. A non-smoking home. Doublewide mobile home (2 queens, 1 queen sleeper sofa, & 2 singles), 2 full baths, central air conditioning, dishwasher, microwave, washer & dryer, telephone, satellite television, DVD player, internet, deck, lakefront screened porch, gas grill, sundeck on top of the boathouse, and a dock. 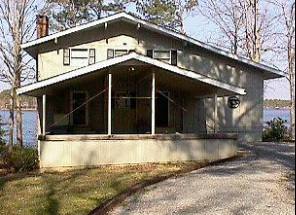 This Lake Gaston rental home is on a gently sloping lot on a medium size cove in Mill Creek in the the northwest quad. Ideal for skiing and knee boarding. Small wading area for the little ones. A non-smoking home. 2 queen beds, 2 doubles, 2 singles, 1 set of bunk beds, 1 crib, 3.5 baths, central air conditioning, ceiling fans, dishwasher, microwave, washer & dryer, telephone, satellite television, DVD player, lakefront deck, screened porch, gas grill, and a dock. This two story, very upscale home is on a very flat lot in the northwest quad with a stunning view of the main Lake straight ahead, but with the dock and swimming area on the side cove. There is a view of the Lake from every room in the house. A non-smoking home. 1 queen bed, 1 double, 1 double sleeper sofa, 1 triple bunk bed, 3 single beds, 3 full baths, central air conditioning, dishwasher, microwave, washer & dryer, satellite television, DVD player, lakefront deck, gas grill, and a dock. This large home has a full finished walkout basement with a family room on both levels. The home is on Poe Creek in the southeast quad, very close to the water, on a very gently sloping double lot with lots of trees and privacy. A non-smoking home. 3 bedrooms + a sleeping mezzanine. 1 king bed, 2 queens, 1 queen sleeper sofa, 2 double beds, 2 full baths, central air conditioning, dishwasher, microwave, washer & dryer, cable television, DVD player, high speed wireless internet, has a lakefront deck and a patio, a gas grill, is on a large lot with a terrific lake view, and has a private dock. There’s a small sandy wading area for children. It’s near a golf course in an excellent neighborhood. In the southeastern quadrant on a large cove directly facing the main Lake. A non-smoking home. Call 252-557-3239 or email info@lcrlakegaston.com for Lake Gaston rentals & reservations.